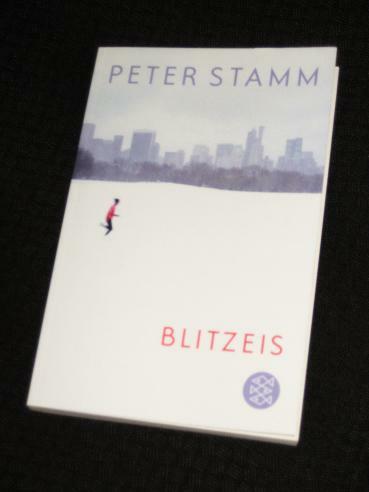 Having read all of Swiss writer Peter Stamm’s novels, I’m now working my way through his short stories, and Blitzeis (‘Black Ice’) is his first collection of shorter pieces. It only runs to around 130 pages, but there’s a mix of brief scenes and extended pieces, ranging in length from two (!) to twenty pages. Despite the smaller canvas, the stories will be very familiar to anyone who has read Stamm’s novels, with the usual stripped-back prose and his rather ambivalent approach to the way men and women interact. Stamm spent time in the US a while back, (his debut novel Agnes was set in Chicago), and several of the stories mine his experiences there, examining the lonely foreigner overseas. In ‘Treibgut’ (‘Flotsam’), we have a Swiss ex-pat rooming with Lotta, a Finnish woman hiding from her former lover. Along with two of the narrator’s friends, they take a short break to an island near the city, a weekend which has unforeseen consequences for all of the group. The focus on New York is secondary, though, as place is rarely as important in Stamm’s work as the focus on relationships – which usually have little to do with love and affection. In ‘Am Eisweher’ (‘Ice Lake’), some fun night-swimming in summer goes from harmless flirting to tragedy in the matter of pages. ‘Was wir Können’ (‘What We Can Do’) then sees the narrator reluctantly getting involved with an awkward woman he has no real interest in, doing his best to play along until he’s ‘forced’ to make his disinterest clear. Stamm’s themes are perhaps best presented in ‘Jeder Manns Recht’ (‘Everyone’s Right’), the story of a canoeing expedition in Sweden. The story focuses on two couples, each representing one of Stamm’s pet topics, and he gets to play with the tension both among and between the couples. The two honeymooners are annoying from the start, the man cowed by his energetic, passive-aggressive wife, but the main interest is in the narrator and his partner, an old childhood friend. Having known each other for decades, you would expect them to get along amicably, but Stamm can’t help but insert some unresolved sexual tension, making for a rather interesting few weeks in the boat. Having read a fair amount of Stamm’s work, it’s hard to defen d him completely from criticism of the way he portrays women in his work. Misogynistic is a word I’ve heard used to describe him on more than one occasion, and you can certainly find negative examples of female characters without looking too hard. In this collection, we have the ‘loose’ Stefanie from ‘Am Eisweiher’ (the narrator almost immediately informs us that rumour has it ‘she does it with anyone’), the teasing Monika from ‘Jeder Manns Recht’ (stringing her ‘old friend’ along) and the flighty user Lotta from ‘Treibgut’ (who appears to be playing the three men off against each other) – and that’s far from a complete list. Ihr Gesicht glühte von der hitze der Küche, und sie strahlte vor Stolz über ihr Werk. In diesem kurzen Augenblick tat sie mir unglaublich leid und mit ihr die ganze Welt und ich mir selbst, und zugleich liebte ich sie mehr als jemals zuvor. This is just one of many examples of the narrator destroying a pleasant moment with sharp, bitter comments, perhaps a self-defence mechanism against future disappointments. So is Stamm the misogynist here, or is he using his narrators (and is there a difference)? I’m not sure, but it works, for me at least. 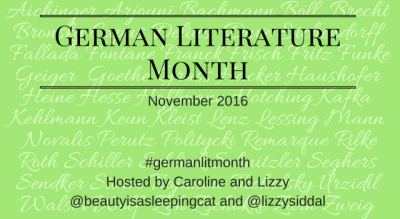 Where I was bored with my last short-story collection (Judith Hermann’s Lettipark), Blitzeis was a collection which held my attention throughout, and I couldn’t really say that any of the stories lost me along the way. Just as is the case with his novels, I was caught up in the awkward interaction of Stamm’s characters, knowing that a (metaphorical) train wreck is always just around the corner. These aren’t Happily-Ever-After stories, but brief slices of life presented in the cold light of reality. Ich stand auf und verabschiedete mich von ihr. Sie fragte ob ich zu ihrer Beerdigung kommen werde, und ich sagte, “nein, wahrscheinlich nicht”. No, his characters aren’t always (are rarely) nice people, but his stories make for good reading. Is that enough? The English translation bundles Blitzeis in with Stamm’s second collection of stories, together entitled In Strange Gardens and Other Stories (translated by Michael Hofmann, published by Other Press). I’ve read something about this book recently – have to dig it out. I’m not always in agreement with Peter Stamm, he does often seem like a grumpy old man to me (and very Swiss in some ways). When it comes to grumpy men, I have to admit I prefer Thomas Bernhard or Peter Handke. Good to know this has been translated. I’m hoping to read Unformed Landscape this month (recommended by you I think).